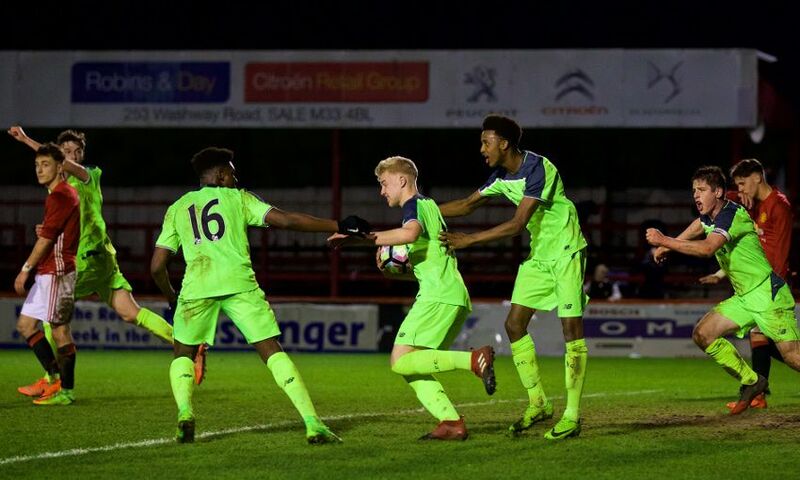 Liverpool started the U18 Premier League end-of-season mini-league with a point as they earned a 2-2 draw against Manchester United in dramatic circumstances on Friday evening. The Reds went ahead early in the first half as Glen McAuley notched his 16th goal of the campaign with a typical poacher's finish. But a red card for Adam Lewis shortly after changed the flow of the game, and United took full advantage in the second period as they turned things around through Aidan Barlow's double. The visitors refused to lie down, though, and levelled in injury time as substitute Luis Longstaff turned the ball home from close range from a set-piece. With his side having ended Manchester City's 21-game unbeaten run in their last outing, Neil Critchley opted to make just one change for the trip to Altrincham. Yan Dhanda, who notched three goals in the Reds' two previous games against United, returned to the starting XI in place of Okera Simmonds. The young forward was at the heart of a promising early moment for the visitors, but picked the wrong option in attempting to shoot from the right-hand side of the box after a quick counter. United, meanwhile, were relying on Josh Bohui as their main threat, with the winger forcing Caoimhin Kelleher into two saves before dragging a shot just wide with the game still in its infancy. The opening goal came on 20 minutes courtesy of two men who have been ruthless in front of goal for LFC U18s so far this term. After bursting away from his marker and reaching the byline on the left, Liam Millar pulled toward McAuley, who was willing to risk injury in poking the ball home ahead of the hosts' 'keeper. But, while the goalscorer emergd unscathed from the moment that saw the Reds go ahead, Millar did not. The Canadian was forced off in the immediate aftermath due to injury, with Simmonds his replacement. And things went from bad to worse for the visitors with half an hour gone, as Lewis was shown a straight red for a rash challenge on Indy Boonen. The dismissal forced a change in the pattern of the game, with Liverpool forced to sit deep in order to mitigate for their opponents' numerical advantage. But it was Dhanda who went closest from either side before the break, shooting just over the bar from the edge of the box. United looked to make the most of the Reds' one-man deficit at half-time as they introduced talented attacker Angel Gomes in place of centre-back Max Dunne. However, the hosts were met with a wall of resistance as they looked to level things up, with Callum Whelan and Ethan Hamilton both seeing shots saved by Kelleher shortly after the restart. The Irish goalkeeper was assisted on several occasions by his defenders, who produced some marvellous blocks to keep the Red Devils at bay as the second half wore on. But Liverpool's backline could only stand so much pressure, and was breached when Barlow produced a low curling finish from the edge of the area 10 minutes from time. The hosts' No.14 then followed that up by smashing home a fantastic drive from 25 yards that left Kelleher rooted to complete the comeback for United. The Reds could have been forgiven for letting their heads drop with it appearing their exertions with 10 men had earned them nothing but a defeat at the hands of their old rivals. But they showed incredible spirit to ensure that wouldn't be the case, with Longstaff forcing a goal after the ball had been flicked back into a dangerous area from Dhanda's free-kick. Liverpool: Kelleher, N. Williams, Glennon, Masterson, Johnston, Coyle, Dhanda, Sharif, McAuley (Longstaff, 80), A. Lewis, Millar (Simmonds, 24). Subs: R. Williams, Atherton, Adekanye.